Home Crops	How to make cane syrup at home… without a sugar cane press! How to make cane syrup at home… without a sugar cane press! 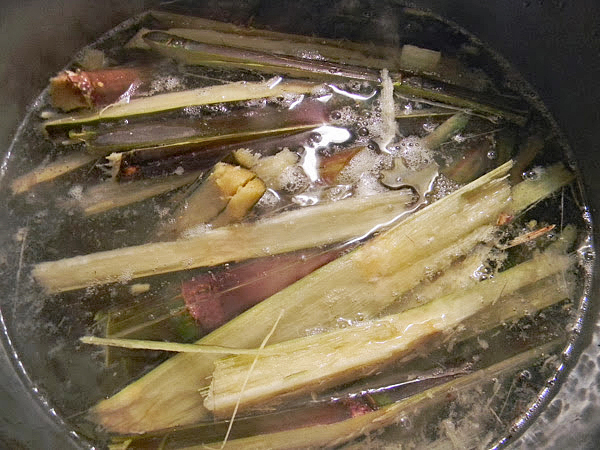 It’s sugarcane season again and time to make cane syrup at home. This post was originally written and posted in November of 2013 but it’s time to bring it back to the foreground, dust off the good stockpot, and show just how easy (though time-consuming!) homemade cane syrup can be. First, you might enjoy this video I created documenting the entire process, then we’ll get into the step-by-step photo guide. 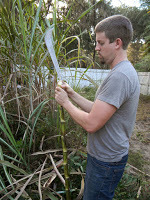 As you regular readers know, I’ve grown sugar cane for a few years now. The kids love it and it’s a nice novelty but I always wanted to do more with our crop than just hack chunks off for chewing. Back in 2012 when I planted a big bed of sugar cane, I knew that at some point I’d have to figure out how to process it into something useful. Since distilling is apparently illegal, rum was out… but homemade cane syrup sounded like a winner. Plus, Rachel wanted it, so it had to be made. This post shares how we figured out how to make cane syrup without a cane press and how you can make your own delicious cane syrup the same way. 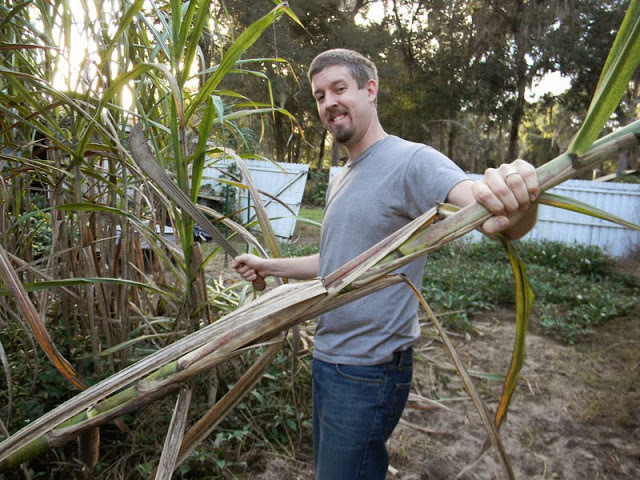 In North Florida there are freezes in winter that will knock sugar cane down to the ground, so this is the time of year we cut canes. It’s got to happen before frost or the crop will be ruined. Cane harvesting is fun because you get to use a machete. Anything is better with a machete (except opening coconuts). To harvest sugarcane, I cut the canes close to the ground, then strip off the leaves and throw them over the “stumps” I leave behind. Because sugar cane is a cold-sensitive perennial, covering up the roots will keep the plant safe until next spring when a whole new batch of homegrown sugar will rise from the ground as soon as the soil warms up enough. Sugarcane tends to have mildew on its stems, along with dust, dirt and the occasional bug. I don’t want these in my syrup so I scrub the canes after removing the leaves. I like to do this over one of my garden beds and rinse with the hose as I go. I don’t use soap or anything, just water and elbow grease. The canes are truly beautiful when they’re wet – they look like lovely varnished bamboo. Contemplating their attractiveness helps alleviate the mind-crushing boredom of washing a stack of them. Here’s the big problem with sugar cane: it’s full of fibers. You can’t just put chunks in your juicer. I tried… and I don’t think my Champion juicer will ever be the same. After multiple jam-ups and some smoking and shaking which only yielded about a half-cup of syrup, I realized it was pointless. Normally, sugar cane is processed with powerful presses that crush it flat and let the sugary juice run out. I don’t have anything like this at home and couldn’t figure out a good way to jury-rig something. Real presses are really expensive – and the Thai ones they often sell on e-bay are made for flattening squid, not crushing something as tough as sugar cane. What we decided to do was simply chop the sugar cane into chunks, then quarter those segments. A good heavy meat cleaver works well for this. After chopping, we put the pieces into a large stockpot, covered them with water, then started boiling the sugar out of them. This takes some time and you have to make sure they stay covered with water, so top the pot off occasionally. As the cane cooks, it will lose its lustrous color and start to turn pale brown. Once the flavor of the water is the same as that of a chunk of the boiled sugar cane, you’re ready to move on to the next step. This takes an hour or two – I let my tastebuds be my guide. I pour the hot sugary juice through a stainless steel strainer, which brings up a good point: do this whole process with stainless steel implements, if you can at all help it. Aluminum cookware leaches aluminum into your food, imparting off flavors while slowly poisoning you in the process. You don’t want aluminum fortified cane syrup. Just trust me on this one. That said – once you’ve poured off the juice into a second pot, it’s time to get really cooking. This step (and the previous one) makes your house smell amazing. It’s not the molasses smell you would expect, though; it’s more of a delicious sweet corn aroma. 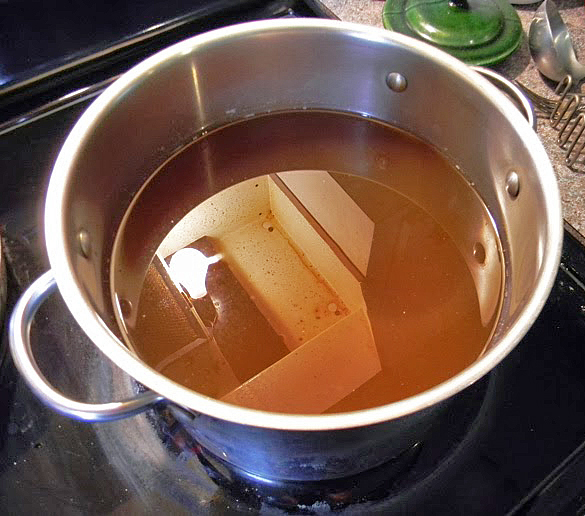 You’re going to boil… boil… boil this juice until the liquid has reduced in the pot to a dangerously low level. Just keep a half an eye on it and find something nearby to do, like the dishes… or beer pong. If your juice hasn’t thickened when the pot has boiled down to an inch or so in the bottom (mine is never thick enough at that point), then pour your big pot’s contents into a smaller pot and proceed to the final step. You’re really close to the end now. It’s the final stretch! At this point, you need to be careful not to let the syrup burn, turn into caramel or boil over. Cook it with constant supervision and be ready to pull it off the burner at a moment’s notice. The bubbles start to get very thick and glassy as it nears syrup consistency. My first batch was very, very thick so I learned to back off a little on the final boil down. Dip a spoon regularly into the syrup and see how thick it is when it cools. Congratulations! You’ve made your own home-grown, organic, vegan, free trade, sustainably harvested, locavore-approved, non-GMO, gluten-free, amazingly delicious sugar cane syrup! Sure, it’s a lot easier to juice the cane first, rather than doing the chop n’ boil… but if you’re just a hobbyist like me who wants a few jars of syrup to give away at Christmas, this beats having to buy a specialized extractor or find a local cane mill. I bet it would also work for sorghum… try it and see. As a final note: homemade cane syrup tastes absolutely amazing… you’re gonna try it and love it. I have no idea why it isn’t as popular as maple syrup. In mind they are neck and neck. 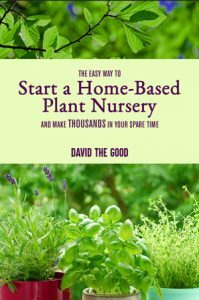 If you are interested in growing your own sugarcane patch, I cover the process in one of the appendices of my popular book Totally Crazy Easy Florida Gardening. 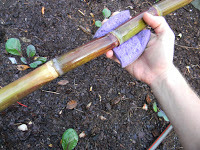 Sugarcane is easy to grow even in a backyard patch. My bet is that if there’s a crisis, sugar will skyrocket in value. And if there isn’t a crisis, then hey – you’ll still be enjoying some sugarcane. How many canes did you end up harvesting, and what was the corresponding yield? Looks like a fun experiment. I would say 6 – 8 canes of 4-5' length processed down to about a half-pint. We made the syrup quite thick – thicker than most folks' cane syrup – so you might get more yield with a lighter syrup. And yeah… it was totally fun. I'm probably going to make more tomorrow. Which varieties do you grow? Also how many plants do you think a household would need for a year? We grow four different types – unfortunately, I don't have the names of any of them. They were picked up from various farmer's markets. As for "how many plants," I think a 20' x 20' patch would easily keep you in sugar for the year. This is fantastic! I am also curious about yield, and yield by boiling extraction vs. pressing/grinding. There are two farms in Gainesville producing cane syrup and Morningside Nature Center does a demo day every year which is a lot of fun. Cane syrup is great for baking! I'm sure crushing/grinding/juicing would give a better yield. I'm going to have to work on that for next year – but I'm still pleased as punch that I could pull off a great final product despite lacking serious cane processing tools. I'll bet the syrup would be fantastic for baking. The flavor is wonderfully rich. I wonder if a stainless steel kitchen garbage disposal would pulp the cane up and then have the pulp pressed to extract the sugar cane juice. I've seen videos using the disposal for apple cider making. It's a good idea. I have a feeling the fibers would really wreak havoc, though. Apples are certainly softer. That said… I'd happily try it if someone has a spare disposal. I'd never thought of a food waste disposal as a sugarcane press. Interesting idea and certainly cheaper than an imported press. 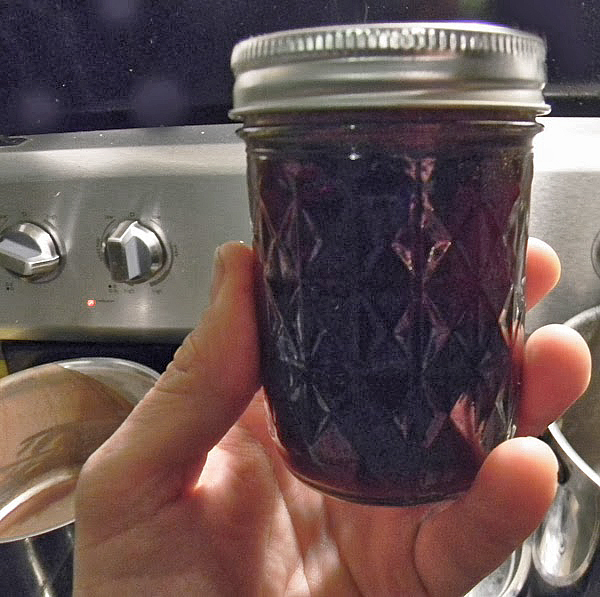 Aluminium fortified syrup… MMM, MMM! So… How do you get it to that crystallized candy stage? My first batch got really close to becoming caramel… I had to thin it out again. There's a trick to getting candy crystals that I believe involves "seeding" the syrup… maybe I should try that next. How long does it keep in storage? Do you do anything special? Hi Maine Lady – thanks for stopping by. If I wanted to make sure it kept indefinitely, I'd take the jars and then boiling water can them and put them away in the pantry. However… our syrup thus far has disappeared so quickly that I can't tell you how long it would keep without being canned. Being a thick syrup like molasses, I can't imagine it spoiling. I made a press using an old fashion laundry wringer and a 5 gallon pail. That's awesome. I'm surprised it could handle the pressure. Do you have a picture you can e-mail me – I'd love to post that. I second that- would love to see how that works. Yes… if they're built tough enough, you could put all kinds of things through one. Man… I'm going to have to check 'em out at the antique store. I bought an old wooden wringer off of craigs list because I read somewhere that the old wooden wringer was best for pressing and just did it on top of a 5 gallon pail. I'll have to look and see if I took pics, what is your email? Canoearoo: click on the "Contact David the Good" link just beneath the newsletter sign-up button on the top right. I'd love to post pics if you have them. This is cool. My grandfather did this for 50 years with his brothers and sold in syrup in cans. Used purple cane, which is hard to find these days. This is great! My partner just chopped down a little patch of sugarcane I had planted in a bad spot. I think I may give this a try; perhaps with a pressure cooker to speed up the process… Have you tried a pressure cooker for Step 4. You're very welcome – thank you. Obviously, the cane is around the pool so you can make rum and throw an EPIC POOL PARTY! Or, of course, you can just make syrup. Do you leave the harder outside of bamboo on or peel it off and just boil the stuff u chew? We left the skin on. I have two established plants and want to use those to grow more. Would you cut and plant the canes while they're still green or does it matter if you wait until its colder? We live in S. Georgia….thanks! 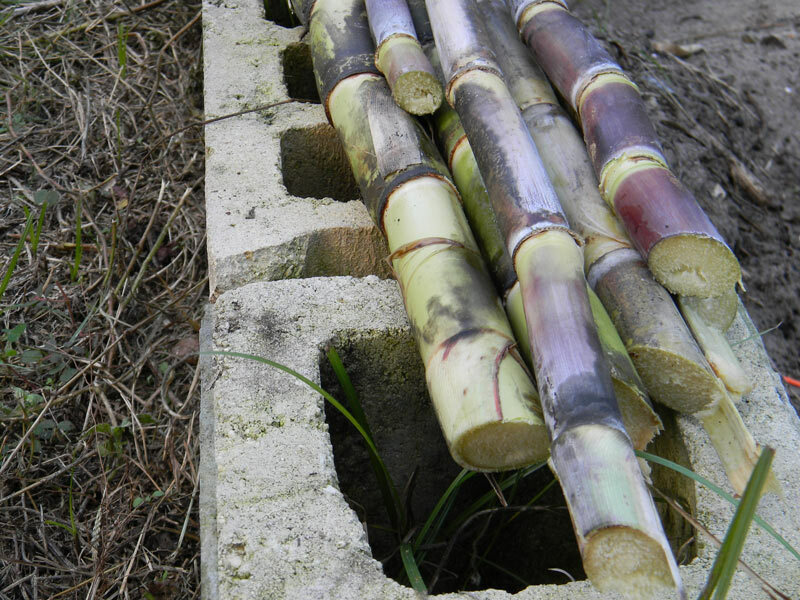 Some sugarcane stays green – if the canes are a good size, plant away and see what happens. Yes… it might be more gas than it's worth; however, you could try growing a lot of quick-growing biomass plants like Tithonia diversifolia and cooking down syrup over a rocketstove with the resulting wood/stems. ebay has some big vtg sugar cane cast iron manual press for $65.79. would those work? 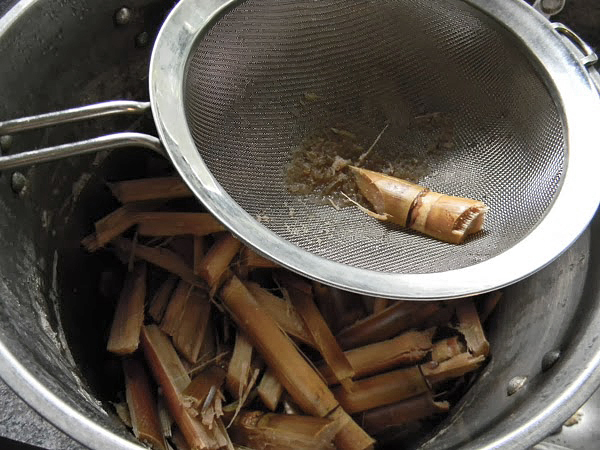 what do you use for making sugarcane juice? Up here in the cooler parts of the country it is sugaring time. We tap our Sugar Maple trees and boil down the sap to make Maple Syrup and Maple Sugar. You might benefit from reading some of the information available online about the process we follow. We can use a very accurate thermometer to know when the syrup is thick enough (7.5 degrees Fahrenheit above the boiling point of water) to make good syrup. Or using a Maple Syrup Hydrometer to test the density. Very good idea. I did some reading on maple sugaring this last winter – quite a science to it, really. That’s so awesome 🙂 Thanks for posting that. After boiling & cooking the slices of cane for 2 hrs. I let it all sit in the covered pot in a cool place overnight. The pot was still warm on the morning so I reheated it, then removed the canes and continued with the cooking process. Are there concerns I need to consider about bacteria, etc since the batch sat over night w/ the canes? I don't worry at all when I know it's going to be reheated over 160. Could this syrup be a substitute for brewing libations? Wine etc.? How well would cane handle colder winters? I’m not sure on the Florida climate, but where we are, we get a couple of falls of snow each winter, which usually only lasts a day or so on the ground before it melts. Would the cane survive in the soil if it were well-mulched, or would I have to lift it and replant in spring? I know it grows up in zone 8 Georgia, so I’ll bet you could pull it off. Have you tried using this with sorghum? No, I haven’t. Would love to try, though. We’ve considered it; however, the sheer amount of force it takes to crush sugarcane makes me wonder if it would be an expensive experiment. I’m imagining the wringer popping to pieces. Thanks so much for this information. Just tried it and got about 1/4 cup from my four small canes..LOL! Fun though, and fortunately we cook on a woodstove so it was able to cook away while I did other things. That’s great! Thanks for the report, Sue. Doesn’t it taste amazing? I’ve made cane syrup for the 3rd time now, using your method. The first time, like you, I boiled it down till it was thicker than intended but now I get a thinner product. I have incorporated an extra step – when I have cooked the sugar cane initially, they are somewhat softer and I am able to blitz them with a very strong blender. 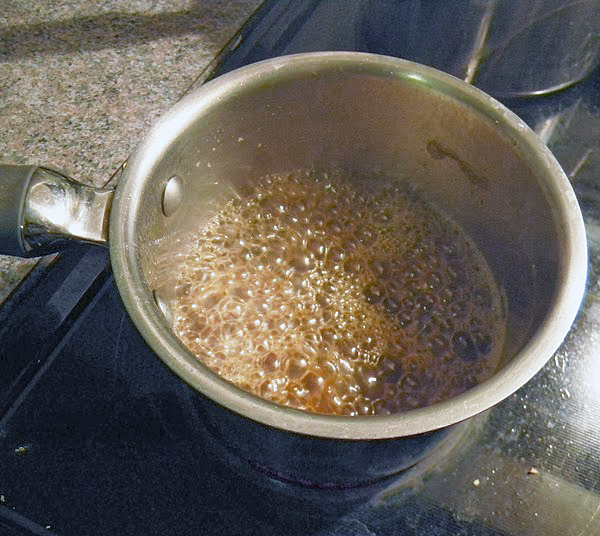 I then sieve the liquid through 2 sieves to remove all the fibres and boil the liquid until it is syrupy as you do. Marinade 600 grams of pork overnight, and roast at 160 degrees for 40 minutes, turning over halfway. Raise the temperature to 180 degrees in the last 5-10 minutes to get some nice charred bits. Hope you’ll enjoy this – I never seem to make enough. I’m growing Apache Red Sugar Cane in Arizona. Just learning. Thanks for sharing your process. I’m trying this with my corn stalks. I’m new to gardening and was pruning a few weeks ago and suddenly realized how familiar they looked. My mom is from Central America and would buy us sugarcane as kids so we would know where sugar came from. Since it’s all organic, I decided to peel it and try a chew, whaddyaknow! Corn tastes like cane! I looked for sugarcane information and this article gave me the most thorough fit info. So far, I’ve peeled, thinly sliced, and run through a kitchenaid grinder my two test stalks. (The kitchenaid got hot but seems to be fine. The fibers were short due to slicing.) They are simmering in a crock pot now and we’ll see what happens! 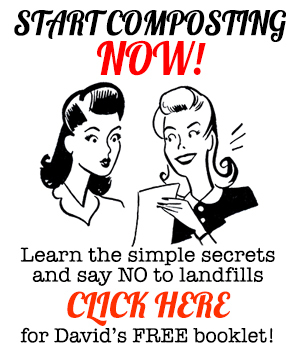 If it works, the rest of my patch is being triple purposed–cobs, syrup, compost! In that order! What a great experiment – let me know how it turns out! we just tried this and did what you said to do but didn’t work came out very bittery.. gross..
I’m sorry to hear that, Susan. It may have cooked at too high a heat – I had one batch go on me because it boiled too hot. I hope you have better luck with syruping in the future. Thanks for stopping by. Thanks, Rinni! Cane syrup is incredible… totally delicious. Have fun and thanks for stopping by. THANKS! Your blog was very helpful. I was recently gifted with a half gallon of cane juice. I boiled it down today and the yield was more than a cup. It took about two hours, but I wasn’t very aggressive with the heat at first. My husband and I love cane syrup but have a hard time finding it in Central Florida. I’m going to go back to the person that gave me the half gallon and see if I can get more! That is marvelous – thank you for sharing. Thanks for the info! I live south of Sebring and bought ~ 20 foot of cane along SR 70 today. Can’t wait to boil it down. I haven’t read through all the comments and this may have already been discussed, but I’d like to suggest using a PVC pipe cutter, available at most any hardware store for $15-20, to cut the cane into manageable pieces. It works wonders and is super efficient. Good work! And I am a big fan of The Life Aquatic, too. This sounds great! 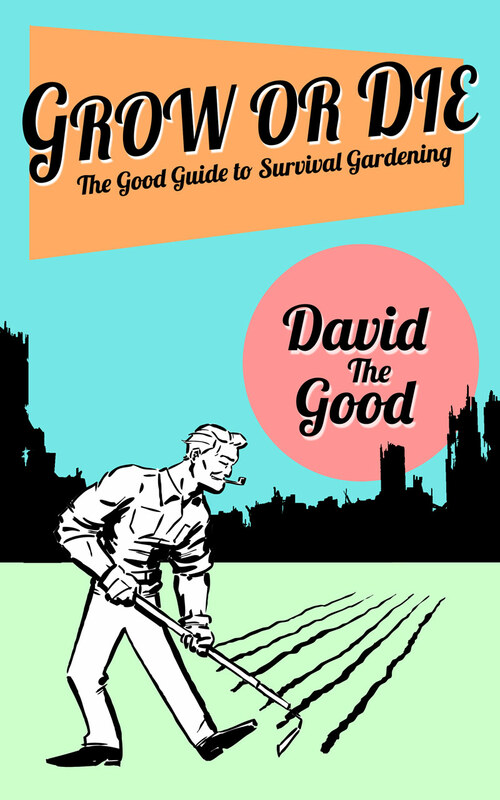 I’m looking for alternative cash crops from a survivalist point of view. One of my goals is to learn how to make my favorite fermented beverage…RUM! I have a few sunny acres in central Missouri and am was wondering if sugarcane would survive the winters here. It may be that I will have to settle on sugar beet instead but would like to try the cane first, if it has any chance. Thanks. Cane is worth a try. See if you can find any info on cold-hardiness. We sell locally manufuctured heavy duty sugar crashers/juicers(manually,gasoline or electric operated) at affordable prices ranging from 1300USD excluding shipping fee. Hi! what size of that mason jar that you used? I found a source of sugarcane seeds – I’m in CT so I can’t get sugarcane at any market around here. I know I’ll have to grow this in a greenhouse. My question is how long does it take to grow sugarcane from seeds and how many years do I have to wait for it to be mature enough to harvest? Thanks for any information you can give me. Congrats on the farm and good luck getting along with your neighbor. Sugar cane seems to stay plantable for a decent time after it’s cut, unless it lays in the sun. Probably a month or so. Try ebay for starts – you might have luck there. just a thought, but if you put a lid and apply a vacuum pump you can probably cut down the heat you use reduce the juice into syrup. It’s one of the methods used to concentrate OJ for freezing. This could help reduce the chance of caramelizing or burning. Florida pioneers made a sort of meade out of sugar cane juice they called cane buck. Someone asked about fermenting it. David, I have seen people in north Florida hook a riding lawnmower to the old cane grinding press poles that used to be run by mules and ride around in circles. They were basically heavy duty gears the cane was fed through and I do not believe a clothes wringer is strong enough to grind cane. The pummings (bagass) that come out of the grinder are totally shredded. I went to cane grindings as a child and I love the syrup. I’d love to find out how they made the mead. What about cast iron pot for boiling?